Cable Attachment Bolt 8mm wrench Front of Arm Markings left: "Campagnolo" right: "Brev. Inter." or "Brev. Int." 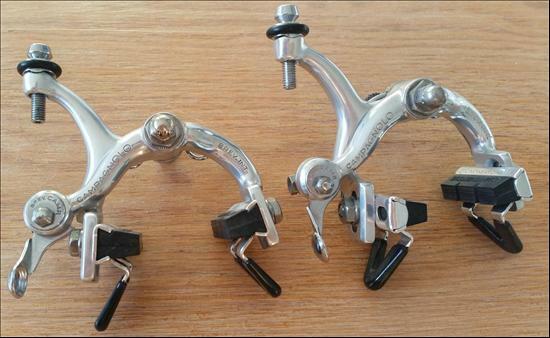 Campagnolo Nuovo Record brakes were produced for many years - beginning in 1968. Lettering was added in 1969. The first-year calipers did not have the "Campagnolo" name stamped on them and they had a square rear shoulder section marked "BREV CAMP" on the front caliper center bolt. Original releases of these brakes were nutted, and later variations were available with recessed mounting.